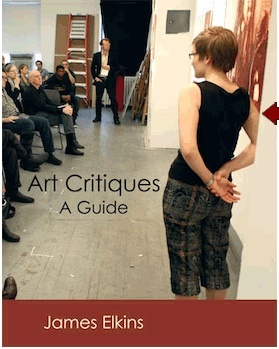 After participating in final critiques at Brooklyn College and MICA last semester, I posted some notes for grad students about the critique process, and a reader suggested I check out a recent release from New Academia Publishing called Art Critiques: A Guide. Written by James Elkins, an art history professor who has participated in hundreds of critiques during his ongoing tenure at the School of the Art Institute of Chicago, the book analyzes the critique format, identifying five particular types –the Silent Professor Critique, the Conceptual Critique, the Silent Student Critique, the Boot Camp Critique, and the Anti-Critique. Elkins begins with a transcription of an actual critique, which he explains line-by-excruciating-line, attempting to make sense of the faculty’s encouraging comments, defenses, suggestions, and half-uttered challenges. The comments generally fall into two broad categories—either about meaning or technical issues—and Elkins uses tables and diagrams to decipher what faculty often fail to say clearly or comprehensively. book. “They are raw and undigested. They are often a bit dull. unconsciously perpetuate, and he suggests ways for students to take control of the process, discourage digression, and guide the critique toward the issues they want to address. To be fair, Elkins also includes a lengthy honor roll that lists artists who excel in critiques — Mary Kelly, Chuck Close, Sam Messer, Cheryl Donegan, Dana Schutz, Deborah Kass, Gregory Amenoff, Gary Stephan, and Rochelle Feinstein are on it. Beware faculty: after reading this book, empowered students will be likely to demand that you speak more specifically and explain exactly what you mean. Everyone involved in university art education should read Art Critiques: A Guide. Elkins’s research will undoubtedly have a positive, long-lasting impact on the moribund, confusing, and sometimes humiliating rite of passage known as the Art Critique. thanks for sharing! (and I thought it was just me that found art critiques to be a cross between wanton wankiness, vapid vagueness, dreary despotism, and just plain USELESS…..) must go read the book! Some of my favorite variations on "that's very interesting" are the head nod, the chin rub, and the sudden switch in crossed legs and arms–more often than not some sign of restraint. Best critique I ever attended was when I was a grad student at SAIC in "76. Dike Blair was being interviewed by faculty and staff about his work and he was fidgeting about with an uncomfortable look on his face. All of a sudden blood started trickling out of his mouth and he grabbed a handkerchief to stop it from flowing on the floor. I was freaked out and called for an ambulance or something like that. The faculty continued the crit. I was aghast. Later I found out it was staged. It has been over 20 years since I sat in on a critique. So often I felt like the goal was to make the prof. happy instead of finding my own voice. The book sounds funny, useful, and pertinent. Critiques on subject or meaning always raise the hackles on the back of my neck. Technique can be critiqued in a useful, helpful way. Anything where a personal opinion or slant gets elevated to the same level as technical craft burns me. That's too egotistic. I won't say someone's art is kitsch – that's commenting on subject. Maybe the artist prefers subjects that fashion thinks of as kitsch. If something appeals to common tastes, that's not a point against it. That means the artist may have a very broad audience as opposed to less accessible styles of art. Great post! And I think that's a photo from my grad school on the cover of the book! Can't wait to get my copy.